Autumn Location tactics Produced This Strong-fighting Common! At some stage during the autumn period carp will build up their energy supplies for the onset of winter. As the temperature falls, and especially during the first big temperature drop, carp often go on the feed. It is during this period, and over the following week or two, that many big carp can be caught using general carp fishing and baiting tactics. In fact, some experts believe that the first frost is the best time to go carp fishing in the autumn as the sharp frost can kill off some natural food supplies. With some strong winds that come in the autumn period, looking towards the windward bank is a good place to start locating carp during this time of year. If the weather forecasts suggest that there will be strong south-westerly winds, then the windward bank can be a very productive area to find carp in autumn. Even more so if this warm wind has been persistent over the previous few days. The heavy winds oxygenate the waters helping to trigger a feeding spell. The big winds also stir up the bottom of the lake where debris and bait has gathered together. This provides carp with an abundance of loose food items. If there is a heavy cold wind blowing, then it may be best to look in the margins, especially if the area is covered so it buffers any cold spells. Another good place to locate carp during the autumn is on the back of a cold wind. If you are fishing for carp towards the end of autumn, then the carp may NOT be found at the windward end or at previous hotspots very often. This is because there may have been huge amounts of fallen leaves gathered together at this end. The natural process of breaking down the leaves uses up oxygen in the water and releases carbon dioxide, for this reason carp may avoid these areas altogether until early spring. If during the autumn there are cold, calm days then the shallows may be a good place to find fish when the sun appears in the morning. The snags are usually another good place to find carp hanging out during autumn. They tend to rest up in safe areas after a big autumn feeding session, and lay ready for the onset of winter. 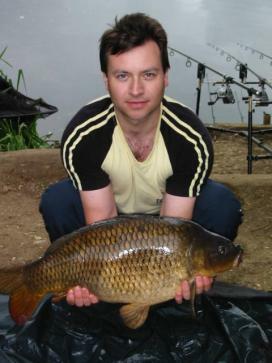 As every lake is different it is very hard to know exactly where to locate carp during any period of the year. The ideas presented in this article are to be used as a rough guide. The best practice for finding fish in the autumn is to study the water you actually fish to find out the normal carp movements over the course of a year. You can speed up this process by asking many local fishermen what they think, or have experienced in the past. Carp are creatures of habit, so when you've found out their locations at different times of the year, they will often repeat these patterns for future years to come!